My friend RISA MICKENBERG wrote it, I saw it and it’s great. You should see it too. EGG is a dark comedy that explores the duplicities of marriage and parenthood: why we revere it, fear it, delegate it, or forgo it. 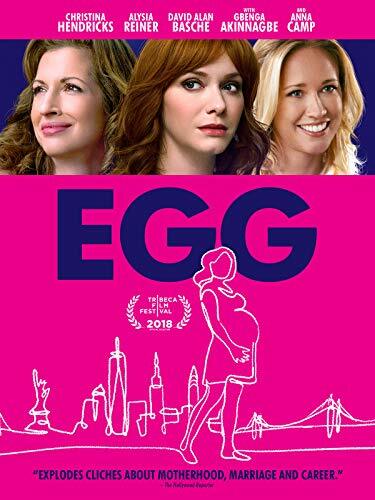 Starring Christina Hendricks (Mad Men), Alysia Reiner, (Orange Is The New Black), Anna Camp (Pitch Perfect) Gbenga Akinnagbe (The Wire) and David Alan Basche (The Good Wife). Written by Risa Mickenberg. Directed by Marianna Palka. The film premiered at the Tribeca Film Festival. Distributed by Gravitas Ventures. Blizzard, yes…but The Really BIG News Is Debi Mazar as Ava Gardner! As heard from the actress’s perfectly painted mouth – on the F Train yesterday! AT LAST! Debi Mazar will play Ava Gardner in a new Spanish series by director Paco Leon titled, “Arde Madrid.” ¡Que rico! ¿Claro que no? Turner had this about her on their site. Gwili Andre (February 4, 1908 – February 5, 1959) was a Danish actress who had a brief career in Hollywood films. Born Gurli Andresen in Copenhagen, Denmark, Andre came to Hollywood in the early 1930s. She appeared in the RKO Studio films, Roar of the Dragon and Secrets of the French Police (both 1932) and began to attract attention for her striking good looks. Her next role in No Other Woman, was not the success the studio expected. Over the next few years she was relegated to supporting roles. Her final role was a minor part in The Falcon’s Brother in 1942. She did not return to the screen, although she spent the rest of her life trying to orchestrate a comeback. As she faced further rejection, she found solace in alcohol. In 1959, on the day after her birthday, she committed suicide in a bizarre fashion. Alone in her apartment in Venice, California, Andre surrounded herself with reams of publicity photographs and press clippings, all of which represented the career she had expected but had not achieved. Setting the paper alight, she allowed herself to be consumed by the fire, sustaining injuries which caused her death. Andre is chiefly recalled as a cautionary example of the indifference of the Hollywood system and the anguish of a person emotionally unable to cope with initial success and promise followed by immediate and irreversible failure. What am I, new here? Who else did I miss? Advice to Young Starlettes and Fresh Meat: Give it your best shot but for God’s sake don’t go out there and do a Gwili, ya hear? No, not a “wheelie”…a GWILI. I said don’t go out there and pull a “Gwili.” It’s not worth it. With a pretty face like that you can do infomercials or trade shows til you’re forty.